We often associate acne with something we only suffer from in our adolescence, but for many people, acne can be a lifelong problem. Adult acne is incredibly common and can range from anything from the odd flare up to a permanent problem. Even when acne itself subsides, it is often replaced by scarring, which can affect the colour, texture and appearance of the skin on the face. Acne scarring can be aggravated by picking spots or not treating the acne properly, but it is not necessarily confined to this, and even for people who seek medical intervention for their acne, scarring can still occur. It can be disheartening to experience acne scarring, especially if you’ve suffered from acne for a long time and managed to get rid of it, only to be left with the resulting scars. Laser resurfacing is a sophisticated method of restoring balance to the complexion and rejuvenating the face. Although it can be used for a whole host of skin complaints – ageing, dulling, wrinkles and even to remove tattoos – it is a very popular treatment for addressing scarring and redness in the skin. What is fractional carbon dioxide laser resurfacing? Mr Chana uses a fractional carbon dioxide laser system, which remodels the collagen in the facial skin to improve texture and appearance. This is an advanced laser system which can target the surface of the skin but can simultaneously deliver energy into the deeper layers of the skin to produce collagen stimulation and remodelling, the result is that the irregularities caused by acne scarring are considerably improved. Your treatment plan is individually tailored, and will very much depend on the extent of your scarring and the results you are hoping to see. Mild laser treatments can be performed with a topical numbing cream, but for deep laser resurfacing, you may be required to have your treatment under sedation. Mr Chana will discuss all this with you in depth during your consultation after she has had a chance to perform a thorough assessment and establish your needs. Modern resurfacing lasers such as the one used by Mr Chana are very precise devices which deliver energy to the skin in a very controlled manner. The laser beam is targeted in the form of a grid which leaves microscopic areas of skin untouched. These tiny areas of untreated skin act as focal areas which enhance healing in the adjacent treated skin. At the same time, the energy is focused randomly within the grid so that adjacent ‘spots’ of skin are not treated together but are further apart before the laser beam returns to the adjacent area. This avoids the heat energy to build up in the same area and therefore controls the degree of thermal damage. Again this aids the recovery process and improves recovery times. The treatment won’t take more than an hour, but you might be required to have more than one session for best results. After your treatment, you will experience some redness, and the skin might feel slightly sore. What is the recovery after fractional carbon dioxide laser treatment? There will be redness, some minor scabs and some weeping of the skin for the first few days. The redness and scabs persist for approximately two weeks. During this time Mr Chana will provide topical cream to keep the skin moisturised. You will need to take two weeks off work (particularly for deep fractional laser treatment) for recovery and to allow your skin to resume to normal. In this time, you should avoid wearing products or makeup on your skin – this will allow your skin to heal properly. After two weeks some patients may experience some mild redness of the skin which could persist for a few weeks especially if a deep treatment has been administered. You can expect to see the best results of laser resurfacing treatment about three months after your course of treatment. This gives the collagen cells in the skin time to regenerate and remodel and the skin to accommodate their regeneration. During these months, you must protect your skin daily with a high SPF solution to prevent damage to your skin, which may still be sensitive at this point. Are all skin types suitable for laser resurfacing? If you have dark skin, you might not be a suitable candidate for laser resurfacing therapy. The use of lasers on the skin can affect the pigmentation, and therefore might lighten the skin or in some circumstances cause darkening of the skin. If there is a risk of hyperpigmentation it is possible to pre-treat the skin with hydroquinone cream for a few weeks prior to laser treatment. The laser needs to be used at lower powers and a test patch may be required to assess the response of the skin. However, fractional laser systems have a reduced risk of pigmentation changes since the energy is delivered as a grid which produces less thermal injury. 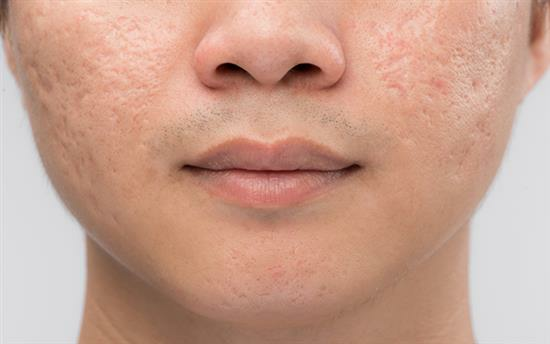 If you are interested in laser resurfacing for acne scarring, you should book a consultation with Mr Chana. Your consultation, in this instance, will allow Mr Chana to determine your level of scarring and devise a treatment plan accordingly. You’ll be given an idea of how many sessions you should undergo, and whether you are more suited to mild or deep treatment.